Relationships don’t survive without honest talks about money. Money conversations can be tough, even when you’re happily married. It’s an incredible gift to your marriage to know how to handle your money in a productive, drama-free way with your spouse. Some researchers estimate that couples who work together to manage their money can double their wealth as compared to their single counterparts. It’s much easier to make progress towards a happy, financially stable financial future when both you and your spouse are working as a team. When you sit down to talk about money with your partner, it’s a good idea to make sure you’re aligned on your long term hopes and dreams before getting to the nitty gritty details. When you sit down to talk, it’s possible you have a different long term goal than your spouse. What looks like success to your spouse might be different than what you envision. If you find that’s the case, that’s OK. The two of you can figure out to build a life that gives you both what you want. That’s the case with Rosemarie Groner of The Busy Budgeter and her husband. Her dream is to have a pile of savings and investments. Her husband wants to travel, have hobbies, and open his own business. Once the two of you agree on the big picture and what you’ll focus on first, you still need to stick to your plan to be able to achieve your goals. Creating a money management system will help the both of you actually living according to your priorities on a day to day basis. How much are you going to save? Where’s the money going to come from? Who’s going to manage the money on a day to day basis, and how will the other spouse be involved? It’s important to nail down these details to make your dreams into reality. There are many ways to actually implement your money system. Some couples sit down to hash out a budget at the beginning of the year. Others sit down every month. You can also create a spending plan to monitor your expenses without writing out an explicit budget every month. While some couples do find it valuable to manage every step of the money process together, others are more successful by divvying up the responsibilities. Kay Bell of Don’t Mess With Taxes pays the bills and handles the monthly money chores. “I take care of the run-of-the-mill stuff, e.g., monthly bills, but I give him a report each month as to our financial situation.” She pulls him in for the big stuff to make sure that they are in agreement. Having an agreed upon money system will mean that spending, saving, and investing can proceed without having to check in on every money decision. It’s not practical – nor any fun – to discuss every money decision before spending money. A spending limit can be a great way to allow for individual spending without money fights. “Have a dollar ceiling that the other person can spend without talking it over,” says Julie Rains of Investing to Thrive. Having some freedom for individual spending can be a great way to let two people accomplish mutual goals without feeling restricted. No one wants to feel controlled or helpless. “You need to be aware that sometimes you have different spending priorities,” says Miranda Marquit with Planting Money Seeds. It saves Scott time as he doesn’t track those categories every month. It also prevents a lot of arguments. If his wife wants to buy a bunch of clothes – or if he wants to buy pricey electronics – there’s no argument as long as it stays with the allowance. “If it’s within the spending plan, there’s nothing to complain about,” Scott says. No matter which money system you use, it’s important to make sure you’re checking in on your progress with your spouse on a regular basis. Systems fall apart without regular communication and care. Jim Wang at Wallet Hacks believes that regular communication is an essential part of managing money as a couple. “It lets you check in financially and discuss things before they reach a breaking point,” Jim says. “I’ve found the most heated arguments are the result of things building up and then some small seemingly unrelated thing causes it to boil over.” Regular communication means you discuss things before either you or your partner is upset, and it’s a much more productive and healthy conversation. Experiment with what method of communication works for you and your partner. There’s no one right way to have a money meeting, as long as both partners are able to participate in a meaningful way. Some couples set a monthly meeting to check in in person. Others create a plan once a year, and then check in as needed. There’s no reason that every money talks need to be in person either. Life gets busy, and checking in with money financial statements by email can be a great way to keep the conversation flowing when life is busy. 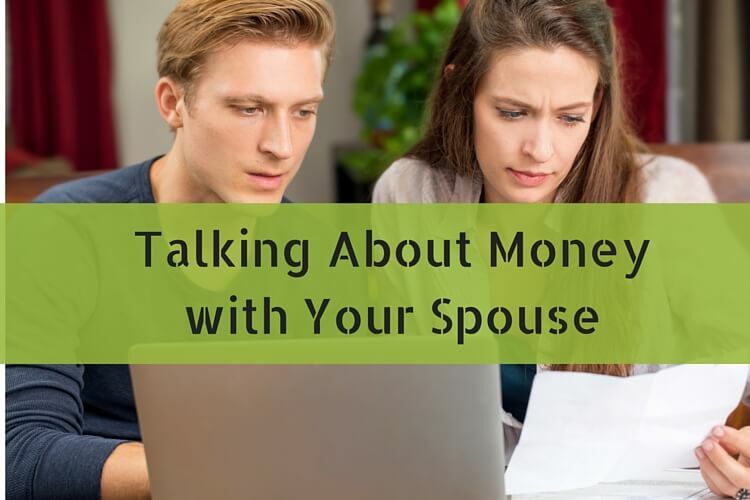 Talking about money with a spouse is an important part of running a financially successful household. Even if you and your spouse struggle to talk about money in a productive way, keep trying. If you experiment with various money management systems and ways of communicating, you’ll eventually find a system that works for you. Finding a peaceful way to spend and save for your goals together is a wonderful thing. If you continue the conversation, you’ll get there.